Our most powerful single CPU workstations (X2 series), receive a massive performance upgrade. Intel's® new Xeon® W processor generation offers more cores, more threads and increased base/turbo frequencies. With up to 18 cores you get up to 3.5 times CPU performance - comparing current generation with a 4 year old (typical workstation lifecycle), similarly priced workstation CPU. Even if compared to its direct predecessor, you gain 30-50% performance at a similar price point or even doubled CPU performance with our Animate/Video X2 top-configuration "Ultra". Ideal for applications that require highest clock speeds on single cores as well as multithread-applications (e.g. en-/decoding, rendering, parallel streams etc.) that are able to max out multiple cores. At XI-MACHINES you get personal consulting to find the perfect workstation for your projects and workflow. We offer expertise in theory and practice - many of our staff have a pro audio, media & creation or 3D/VFX background. Each of our workstations is individually assembled, configured and intensively tested in our Hamburg based manufacture. Trust our 12 years expertise with professional workstations. Do you have any additional questions? 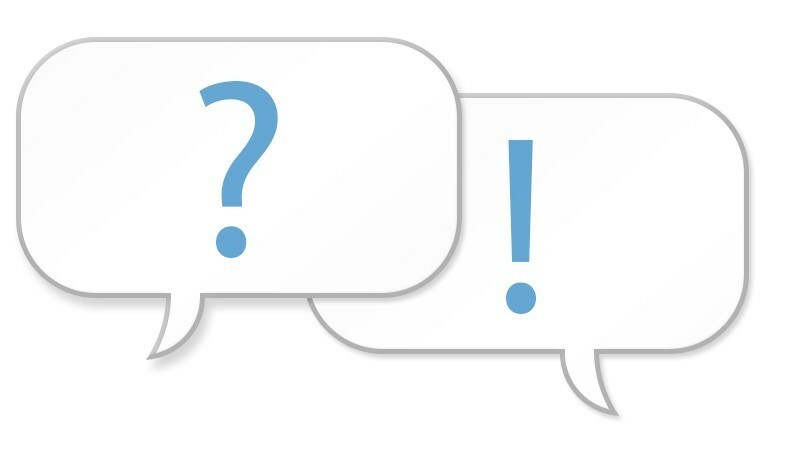 Would you like an interview with our management or our product consultants? Do you require further technical details or additional photos/graphics (e.g. Photoshop files incl. layers)? Simply contact us and we will gladly help you. Perspective shot of our new X2 workstation. XI-MACHINES logo and decoupled feet. reset and power button (left to right). 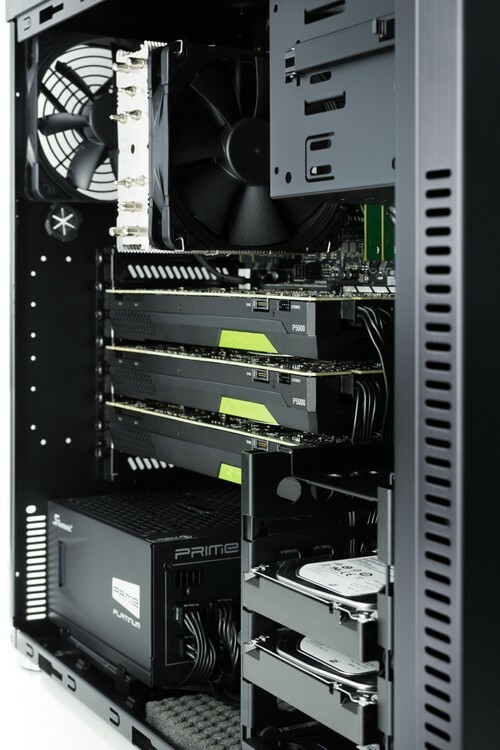 Interior shot of a multi GPU setup optimized for 3D/VIDEO/VFX/Render Workstations (example shows 3x NVIDIA QUADRO P5000 dual slot graphics cards). for quick tool free drive exchange/upgrades. with NVIDIA QUADRO P400 GPU (allowing up to three 4K displays). Detail shot, decoupled hard disk in drive cage. Integrated back plane allow for swift drive replacement/upgrades. (2.5” via adapter, see OS SSD at the bottom). XI-MACHINES now deploys Intel’s latest processor generation in its X2 high performance workstations following an exhaustively rigorous testing process. 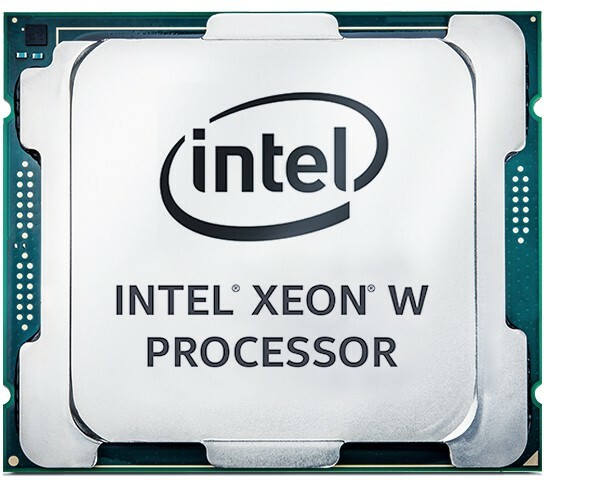 The new Intel Xeon W processors lift performance levels by as much as 114%, depending on the specific model. Performance increases of this magnitude can translate into substantial time savings in day-to-day production work, in turn reducing workload on users. The CPU is among the aspects that have seen a major overhaul for the latest X2 models, now offering 18 CPU cores instead of 8. The first-class 100% aluminum chassis has also been refined both functionally and optically. The X2 is presented in a sleek, all-black finish as well as chrome feet that dampen vibrations. 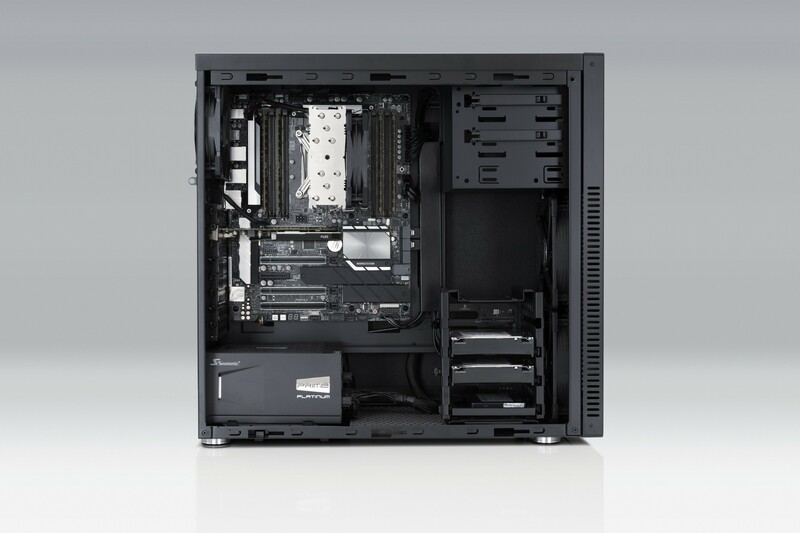 The inner space design of the X2 is – typical for XI-MACHINES workstations – clean, systematic and air-flow optimized. Cable paths are almost completely hidden from view, while the cooling system ensures that the workstation will remain unheard when things get hectic. The new X2 allows 3 dual slot GPUs to be used in parallel, while the highly efficient 1200W PSU ensures optimum electrical power delivery. This precision workstation lets users expand storage space in a way that is exceedingly user friendly, with a backplane built into the drive cage that allows these to be added without installing a cable. The X2 High Performance Workstation now supports M.2- and U.2-compliant SSDs with data throughput of over 3,000MB/s, providing a key advantage in video editing/compositing when used as work or cache drives. The X2 High Performance Workstation is pre-configured for the new Thunderbolt 3 standard, with a TB3 expansion card offered as an option. Fully exploiting these new components, the X2 provides stable, reliable and whisper-quiet 24/7 performance over a design life span of many years. The system also provides for easy filter cleaning by letting users simply remove the front panel by hand, with no tools required. 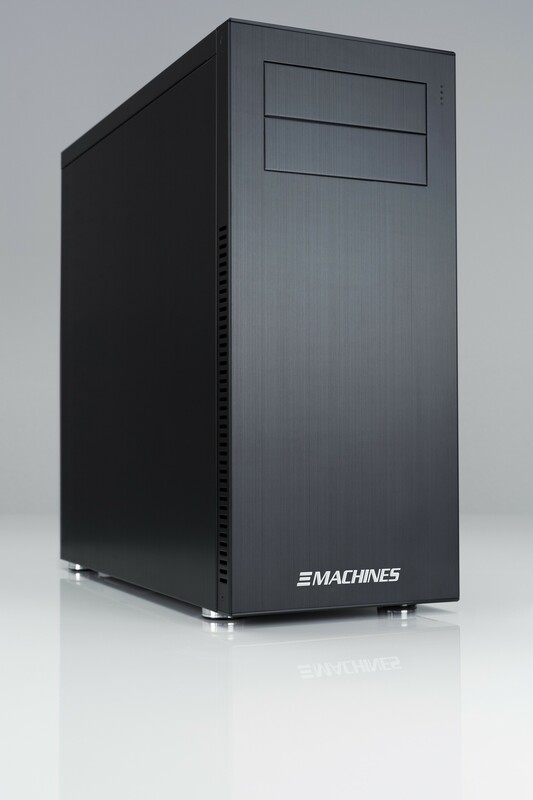 XI-MACHINES’ X2 High Performance Workstation is built by professionals for professionals and optimized for use in areas such as 3D animation, visual FX, compositing, video editing/grading, CAD/CAM, Audio and many others. XI-MACHINES GmbH has been developing professional whisper-quiet Workstations designed for 24/7 operation since 2005. All workstations are developed, produced and tested to the perfectionist quality standards applied every day at XI-MACHINES. This allows XI-MACHINES to guarantee its customers High Performance Workstations that not only provide reliable 24/7 operation but whose attractive design also makes them a visually appealing addition to any professional workspace. Performance increases of this magnitude translate into substantial time savings in day-to-day production work, in turn reducing workload on users. The CPU is among the aspects that have seen a major overhaul for the latest X2 models, now offering 18 CPU cores instead of 8. The X2 has also been optimized for even lower latencies, and lets users expand storage space for sample libraries in a way that is exceedingly user friendly. 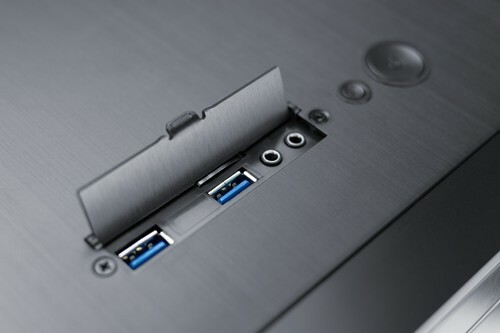 Thanks to the backplane built into the drive cage, these can be added without needing to install a single cable. X2 workstations now support M.2- and U.2-compliant SSDs, offering extremely low access times for ultra-fast loading of samples and flawless, glitch-free overdubbing of hundreds of audio tracks. The X2 High Performance Workstation is pre-configured for the new Thunderbolt 3 standard (a TB3 expansion card is optional) for the latest generation of external low-latency audio interfaces. XI-MACHINES has also updated the precision-made 100% aluminum housing both visually and functionally. The X2 is presented in a sleek, all-black finish as well as chrome feet that dampen vibrations. The inner space design of the X2 is – typical for XI-MACHINES workstations – clean, systematic and air-flow optimized. Cable paths are almost completely hidden from view, while the whisper-quiet cooling system means that the studio noise floor is never exceeded, even at maximum CPU load. Fully exploiting these new developments, the X2 provides stable, reliable and whisper-quiet 24/7 performance over a design life span of many years. The system also provides for easy filter cleaning by letting users simply remove the front panel by hand, with no tools required. XI-MACHINES’ X2 High Performance Workstation is built by professionals for professionals and optimized for use in areas such as composition (VSL-certified), production, multi-track recording, mixing and post production, mastering and Surround/Dolby® Atmos™ production. new X2 workstation generation featuring Intel Xeon W.